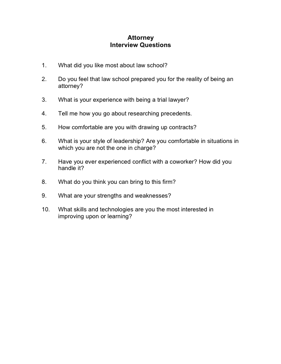 Choose your next Attorney with the aid of these helpful interview questions. 1. What did you like most about law school? 2. Do you feel that law school prepared you for the reality of being an attorney? 3. What is your experience with being a trial lawyer? 4. Tell me how you go about researching precedents. 5. How comfortable are you with drawing up contracts? 6. What is your style of leadership? Are you comfortable in situations in which you are not the one in charge? 8. What do you think you can bring to this firm?